As an online writer, you’re always interested in new ways to get traffic, right? Of course you are. And with good reason. You’re serious about your craft, you take pride in your content, and you want – in fact deserve – the widest possible audience. And more traffic means more readers. More subscribers. Maybe even more customers. So if Google introduced a new feature, designed to help writers just like you to get more traffic, you’d want to know about it. You certainly wouldn’t thrust your head in the proverbial sand and pretend it didn’t exist. Or stick your fingers in your ears and go “la-la-la” until it went away. Well, Google has introduced such a feature. And you may even have heard about it already, but are doing your best to ignore it. It’s called Google Authorship. And you need to get to grips with it right now. Let’s face it; some people on the web are more trusted than others. They produce great content, have gazillions of followers, and when they speak, people listen. They know their stuff and it shows. They reek of authenticity. People like Leo Babauta, Chris Brogan, Brian Clark and (ahem) Jon Morrow. Then there are people we don’t trust. It’s not that they’re sleazy (although they might be); we simply don’t know them. They don’t have a track record online or lots of people vouching for them. They might be awesome, they might be shady, but we just don’t know. So you’ll naturally pay more attention to something Chris Brogan says online (since you’ve been following him for years) rather than something Kris Brogan says (as you don’t know him at all). But until recently, Google couldn’t tell the difference between Chris and Kris. Quite embarrassing for a company that wants to tell us which content to trust and which to ignore, huh? Before Google Authorship came along, Google had no idea who was responsible for creating the content it indexed. And so it couldn’t work out which authors it could trust. Of course it knew all about which sites to trust. The authority of a domain has been a core part of Google’s algorithm since the beginning. Which is why a new page on Wikipedia about, say, twerking will automatically get a higher ranking than a page about it on your Auntie Jean’s personal blog (which is a shame because Auntie Jean is one hell of a twerker). But before Google Authorship, Google was completely unable to distinguish one person from another. Google saw pages; it didn’t see people. So a totally respected writer posting on a brand-new blog would get no more credibility in the eyes of Google than a completely unknown author posting on the same blog. Fortunately, Google Authorship changes this and now writers who create great content are finally getting the credit they deserve. But it doesn’t happen automatically. And unless you act, you’ll remain forever anonymous and untrusted in the eyes of Google. In the past, you could do this informally with a simple credit in the post itself, such as “Written by: Joe Bloggs”. But we still didn’t know who Joe Bloggs actually was in real life – whether he was a trustworthy professional, a pseudonym for someone else, or even if he was the same Joe Bloggs as the Joe Bloggs who also writes on this other blog over here. 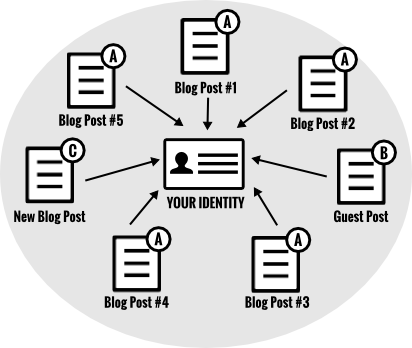 Google Authorship fixes this problem by allowing you to link your identity to every blog post you write. And suddenly, you’re no longer invisible. Google can see you – and the content you’ve written. Once on the radar, you can start to become someone Google trusts. Imagine you’re an experienced writer (and guest blogger) with dozens of posts scattered all over the web. Until Google Authorship came onto the scene, Google had no way to spot the connection between all of those posts – you. And it had no way to reflect your track record in its rankings. 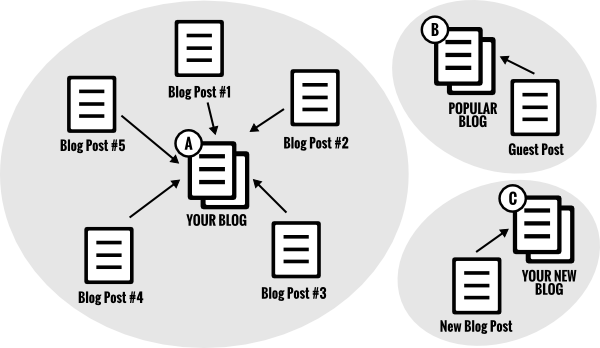 Sure, it understood that all the content on your own blog was somehow connected (by virtue of it being found on the same domain) and could give everything on that site a rankings boost if that content was good. But it had no idea that this post over here on your brand new blog, or that one over there on that big, popular blog were also written by you. In other words, Google had no way to build a full picture of you as an online writer, and no way to reflect your reputation in its rankings. Google Authorship changes all that. Google Authorship allows all of that other content to be linked to an individual. It finally puts the author at the center of the content equation. And it’s not just the content that can be tied to an individual. All of the other useful indicators of respect and authority associated with that content – such as backlinks and social shares – can be attached to the author too. Think about it; Google is finally recognizing for itself what other humans have known for a while – you’re someone worth listening to. And next time you write a post, Google can take all of that history into account when deciding how high it should rank your content in its search results. Most of the time Google keeps its methods pretty close to its chest. In fact, an entire industry has grown up around trying to work out how to drive content to Page 1 of the Google search results. There’s even a seedy black-market in sleazy techniques that try to “game” the algorithm. These sometimes work for a while, but Google always catches up with algorithm updates such as Penguin. Of course, the scammers and the black hatters won’t like it because they prefer to remain in the shadows. But if you are in it for the long run and you’re proud of the content you create, the message from Google is clear: claim ownership of it using Google Authorship. If you’re still not convinced about Google Authorship, one simple reason should make you think again. Even if you don’t start using it, your competitors will. Those people in your industry or niche who are currently on your level in terms of respect, authority and traffic will start to creep ahead. And as time moves on, and Google associates more and more quality content with them – and your quality content remains scattered and (effectively) anonymous – you’ll have a more difficult time catching up. So if you’re serious about making an impact (and perhaps also a living) online with your writing, do yourself a favor: get intimate with Google Authorship.